"Every day do something that scares you." Man, so much has happened and so much to fill you in on. These last few weeks have been insane and marks a few MAJOR moments in my life. Today marks 4 weeks of dedicating myself to living a healthy lifestyle with healthy diet and exercise *wooohooooo*. I was humbled to be honored as a 2012 Woman of Influence from the Portland Business Journal (more on that later). And, I'm going through a huge career transition and embarking on a new venture that is absolutely terrifying, yet when I stop thinking about it so hard...feels so perfectly perfect. For those who are new to reading my blog, I'm a marketing gal by trade. I started at the bottom of every job I every had, learned the business and looked for way to help it grow...that part is in my DNA really. In everything I do, whether as a job or for a client, I look for the nugget of opportunity. That's the premise from which everything I've ever built comes from. These last few months have been extremely hard for me as I ALWAYS know exactly what my goal is and what needs to be accomplished...but it's been hard lately because there are only so many hours in the day. I'm a mom, a wife and a business owner trying to figure out where to go. The easy route - find a job. I say easy because of the security, steady paycheck, not having to worry about running the business and just doing the task at hand. I even met with an executive career counselor who took one look at my resume and what I've built for myself and other companies and says I'd be a shoe-in at an executive job starting at 80K+. Hm, sounds easier than slaving to make enough to cover the bills...barely. But the hard route seems to keep pulling me in - the entrepreneur in me will NOT shut up and no matter how hard I try - I can't stomach working for someone else - I hate it actually and it's because there is NO GROWTH. I must be moving towards something at all times and I don't even take long term retainer clients under my agency, because of this. Plus, there's the struggle of fashion or marketing? Where to put my eggs? It's hard because I HATE doing anything half assed, HATE. And, I've had NO choice but to do some things half assed, HATE. I get so angry and confused and often breakdown crying...where? Where do I go? Well, lucky for me I have the most amazing mentors and friends in my life that seem to think I could conquer anything I started and have unlimited confidence in me as an entrepreneur...even an open checkbook??!! Funny thing is, that makes me MORE terrified...letting those people down would destroy me. But, after 10 years of marketing for large corporations to consulting power players on their startups and realizing that I light up when teaching that maybe I'm meant to teach workshop style? So, I'm going to take that love and with the help of my friend and VP Mandy Allen (NEVER could do this without her - she's pictured above), and with her help turn my knowledge and passion into a workshop series. But, this series will be different, instead of angling for more business (I actually can not take on any more as my roster is full!) or trying to sell my books, I am going to actually GIVE them what they need, and in the end help MORE people. This new venture will be called AHA! 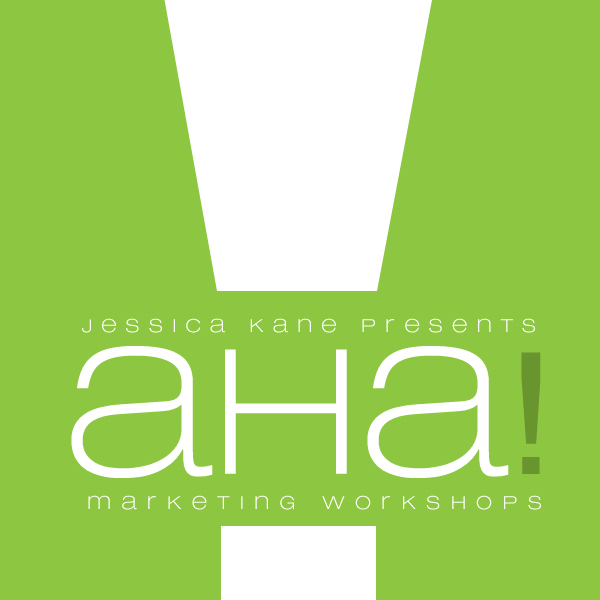 Marketing Workshops by Jessica Kane. I envision hotel ballrooms filled with hundreds of business owners excited and raising their AHA! paddles. And whether this is IT or not...I'm going to try with everything I have. We all have to live our purpose and follow our gut, and all too often I do the nice and right thing and don't follow my gut, but on this one - I think we are in the zone [Mandy Allen] :). I have to say congrats to Mandy for doing something that scared her, but she found the strength to launch her newest blog/project of GENIUS!! Get to know Pep Talk Polly http://www.facebook.com/PepTalkPolly. "A little ray of sunshine to brighten whatever pile of CRAP you're dealing with." <-- YES! So until I announce the official launch of my new baby AHA!, please swing by and enter to win with Project Plus, my new partnership with Sealed With A Kiss Designs! Click here to enter to win 3 SWAK outfits!! Deadline May 18th. Indie Designers night 6.15 #SonsiFFFWeek. Who's your fav designer on the list?